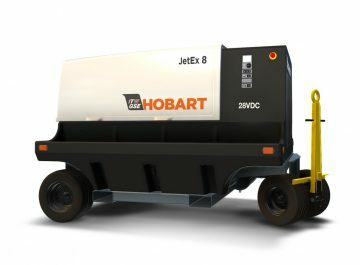 The Hobart JetEx 8 is a mobile diesel-driven 28.5 VDC GPU powered by a Cummins QSF2.8 Tier 4 diesel engine with a Hobart generator. Hobart Generators are the benchmark of quality and reliability giving users the best power quality without sacrificing durability. The Cummins tier 4 Engine meets all the latest U.S emissions regulations. A sliding canopy to provide complete access to the engine, generator and control compartments.The Hobart JetEx8 is capable of 600 Amp continuous and 2000 Amp on Start. Simple easy to use control panel with illuminated digital gauges and back lit push buttons allows for easy operation under all conditions.